Pelli Clarke Pelli Architects (PCPA) connected two preexisting buildings at the A.B. 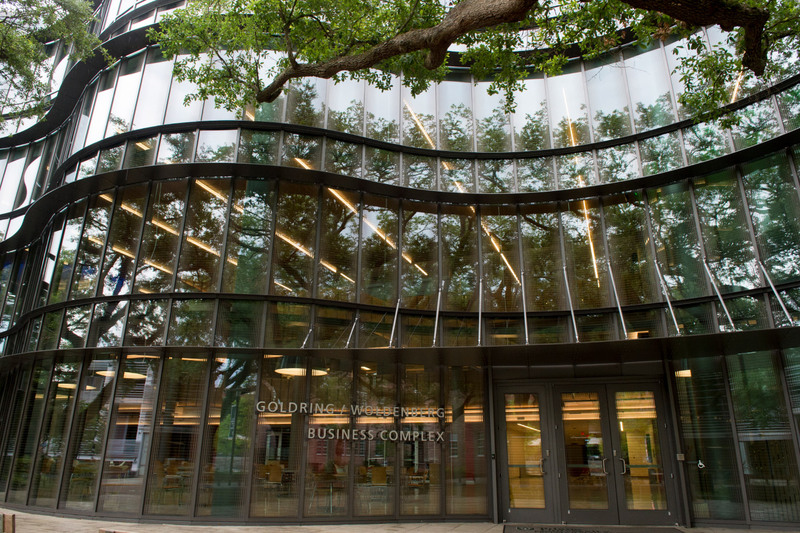 Freeman School of Business at Tulane University in New Orleans with a 46,000-square-foot addition. 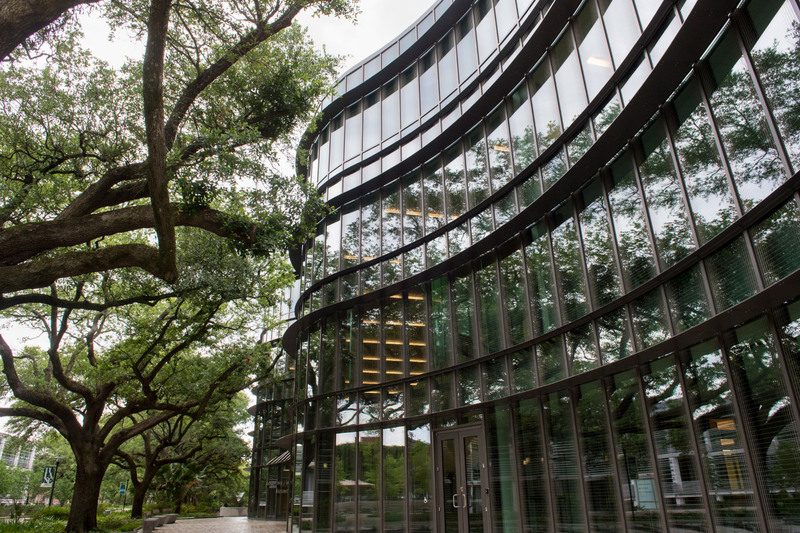 The overhaul also included the renovation of a classroom, two auditoriums, and two lecture halls, joining the complete sum of 85,000 square feet with the sweeping curves of a serpentine curtain wall that weaves around century-old oak trees and also loosely references the university’s team mascot, the Tulane Green Wave, an angry-faced cartoon wave holding a megaphone. Bathed in natural light, the distinctive skin provides transparency and openness to enhance the sense of community and collaboration in the new and existing spaces throughout, which include classrooms, an incubator space for student startups, breakout stations, a new financial analysis lab, and administrative offices. Designed to meet LEED Gold criteria and withstand local weather conditions, especially hurricane impact, the unitized, hurricane-resistant YKK AP YUW 750 XT curtain wall and the Viracon glass hybrid system were fashioned in factory-controlled conditions to mitigate risks relating to quality control. 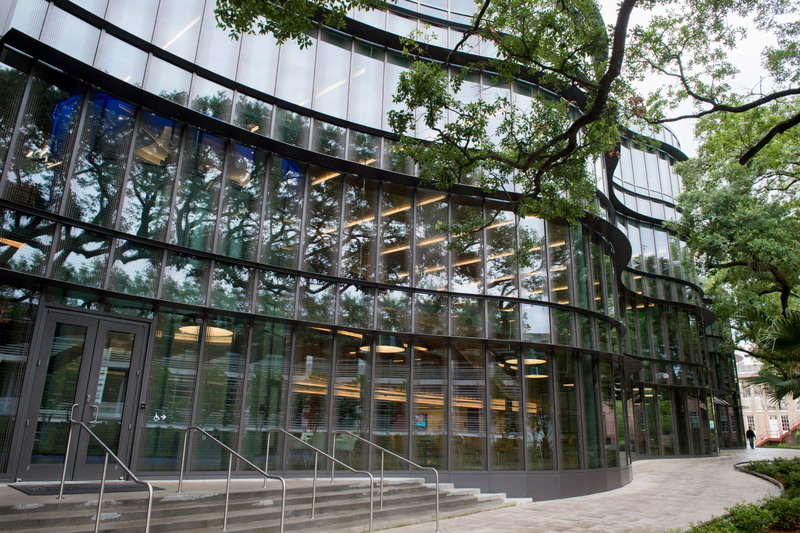 YKK’s thermal sunshades and light shelves were assembled as complete curtain wall system units, allowing for a climate-controlled environment that eliminates interior moisture and thermal transfer. The glazed exterior also features a custom frit pattern by Viracon that maximizes the visibility of the structure for birds. 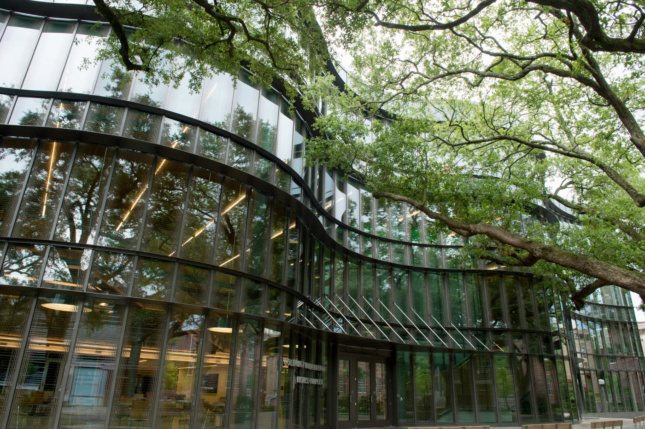 Achieving both performance standards and sinuous construction was not an easy feat. The design, development, and construction process was a multiphase project. Beginning with the layout, the serpentine steel curtain wall was preassembled while the structural steel beams and concrete were put in place on-site. This separate undertaking proved to be problematic, as areas in the curtain wall that didn’t line up with the prescribed 90-degree angle of the field layout had to be adjusted before fabrication. The whirly glass wall required an intricate five-mullion support system composed of two convex and two concave structural supports. This then required the sunshades and solar fins to be correctly positioned at various angles along the multifaceted surface, calling for many custom permutations of anchor brackets machined for specific locations. Other customization was necessary for the sunshades and fins, which had to be miter-cut due to the ever-changing nature of the undulating facade, resulting in massive opening-to-opening variations. Framing Systems: YKK AP America Inc.
Panel Work, Sun Shades, and Fins: Performance Architectural Inc.